This paper presents a method for identifying a representative subset of global climate models (GCMs) for use in large-scale climate impact research. Based on objective criteria (GCM performance in reproducing the seasonal cycle of temperature and precipitation, and a subset ability to represent future inter-GCM variability), two candidate subsets are selected from a reference set of 16 GCMs. An additional subset based on subjective expert judgement is also analysed. The representativeness of the three subsets is validated (with respect to the reference set) and compared for future changes in temperature, precipitation and Palmer drought index Z (direct validation), and occurrence of the European corn borer and snow-cover characteristics implemented in the CLIMSAVE Integrated Assessment Platform (indirect validation). The direct validation indicates that one of the objective-based subsets (ECHAM5/MPI-OM, CSIRO-Mk3.0, HadGEM1, GFDL-CM2.1 and IPSL-CM4 models) provides the best choice for the Europe-wide climate change impact study. Its performance is balanced between regions, seasons and validation statistics. However, the expert-judgement-based subset achieved slightly better results in the indirect validation. The differences between the subsets and the reference set are generally much lower for the impact indices compared to their mean (across all GCMs in the subset) changes due to projected climate change. The ranking of the candidate subsets differs between regions, climatic characteristics and seasons, demonstrating that the subset suitability for a specific impact study depends on the target region and the roles of individual seasons and/or climatic variables on the processes being studied. The online version of this article (doi: 10.1007/s10584-014-1297-7) contains supplementary material, which is available to authorized users. The experiments were made within the framework of CLIMSAVE FP7 EU project (no. 244031), WG4VALUE project (no. LD12029, funded by Ministry of Education, Youth and Sports of the Czech Republic), the OPVK project (no. CZ.1.07/2.3.00/20.0248) and KONTAKT II project (no. LH11010). 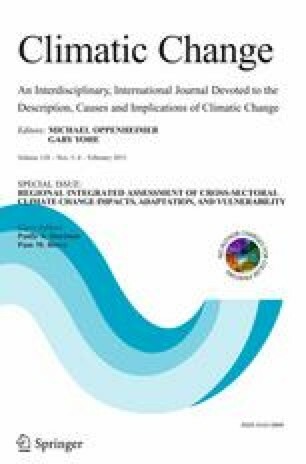 The authors acknowledge the free access to GCM outputs (obtained from the IPCC’s Data Distribution Centre; http://www.ipcc-data.org/gcm/monthly/SRES_AR4/index.html) and the gridded observational climatological data [CRU TS 2.1 (Mitchell and Jones 2005) and CRU CL 2.0 (New et al. 2002); http://www.cru.uea.ac.uk/cru/data/hrg/]. MAGICC climate model (version 5.3) was obtained from http://www.cgd.ucar.edu/cas/wigley/magicc/. We also thank to two anonymous reviewers, whose comments helped to significantly improve this paper.